Our guests always praise the calmness exuded by the wide-open valley and the buildings of the former missionary station with its age-old trees and sprawling lawns. But besides a place of relaxation, Ghaub is also a place of adventure. A charming contrast to Etosha: The 30 km² mountainous area of our nature reserve is home to game such as oryx, impala, eland, blesbok and red hartebeest. We almost always encounter white rhinos. 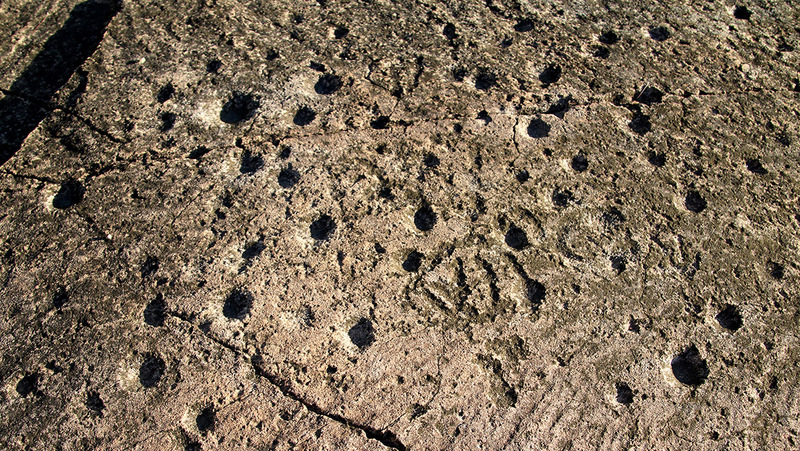 Another highlight is the unique rock engravings of our ancestors. Experts rave about the elephant. 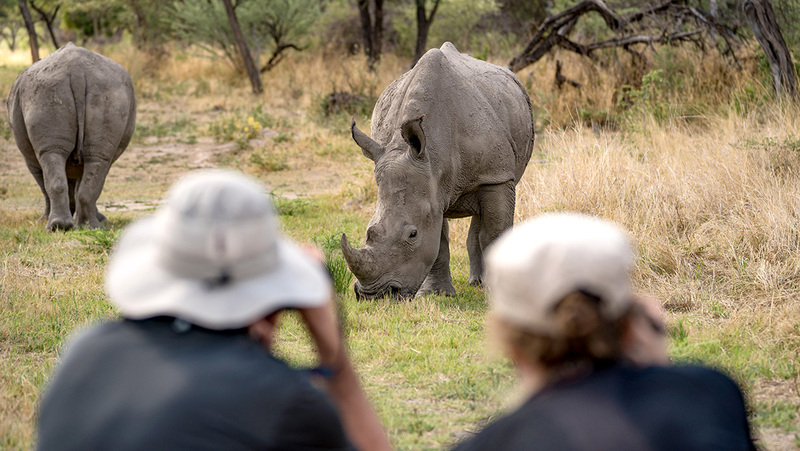 Accompany the trackers of our "Rhino Patrol" on foot in their search of the white rhinos. You will learn a lot about the behaviour of the animals. With a little luck you will encounter the rhinos on eye level. Fitness is required. Not for claustrophobic visitors! Physical fitness is also a must: the deeper the cave, the less oxygen in the air. With a passage system extending to a length of 2.5 km, the Ghaub limestone cave is the third largest cave in Namibia. We have to crawl and climb in places, so please wear sturdy clothes and shoes. Helmets and headlamps are provided. Whether you want to take a walk or go on a hike – well-demarcated trails lead you through the mountain paradise of Ghaub with its over 250 bird species. 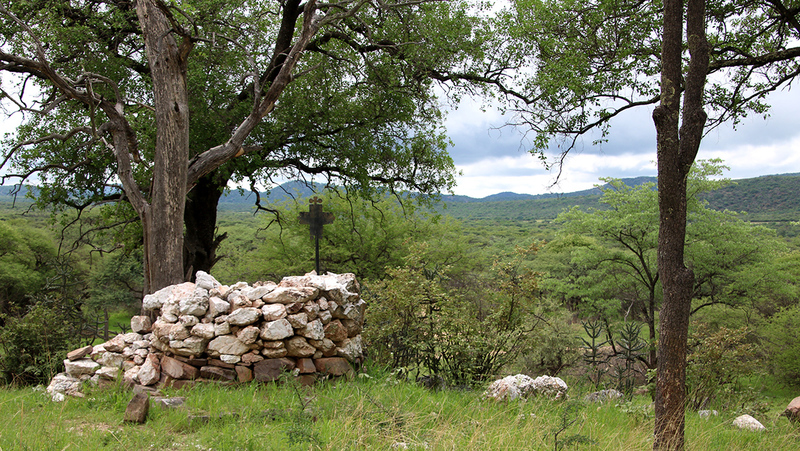 A cemetery and a stone pulpit at the side of the road are historical reminders of a small missionary parish and the last fights between the German Schutztruppe and troops of the South African Union during World War One. See the largest meteorite ever found on earth on farm Hoba near Grootfontein (45 min. drive, open whole day, entry fee): The Hoba meteorite consists mainly of iron, weighs 50-60 tons and has a cuboid form with measurements of approx. 0.90 m x 2.70 m x 2,70 m. It is over 190 million years old and hit earth about 80,000 years ago.